A week after U.S.. government officials informed an Orlando gun shop owner that his request to export semi-automatic weapons, ammunition and ballistic armor to Haiti had been denied, the federally licensed arms dealer fired off an email to a Pompano Beach ballistic armor company and requested personal protection gear on behalf of Haitian police. “We already have an export license,” Joseph emailed back. It was a lie, say federal authorities, who accuse Joseph and his brother Jimy of conspiring to ship firearms and ammunition from the U.S. to Haiti without a license. The firearms were concealed in a white Mitsubishi Fuso commercial work truck that had been shipped from Palm Beach County, and arrived in the port of Saint Marc on Aug. 30, 2016 aboard a Monarch Shipping Lines freighter. The owner of Global Dynasty Corps., LLC in Orlando, Junior Joseph is currently on trial in Fort Lauderdale, where government prosecutors say he and Jimy, whose own trial is scheduled to start next week, concealed 159 semi-automatic single- and double-barreled 12-gauge shotguns, five AR15s and two 9mm Glock 17 pistols inside the truck and illegally exported them to Haiti. Also hidden in the vehicle were tactical vests, police boots and more than 25,000 bullets including shells for the shotguns. The case could go to the jury as early as Friday, and Junior, like Jimy, potentially faces a long prison sentence if convicted. The most serious charge, conspiracy to export fire arms without a license, carries up to 20 years, a $250,000 fine and three years of supervised release.. 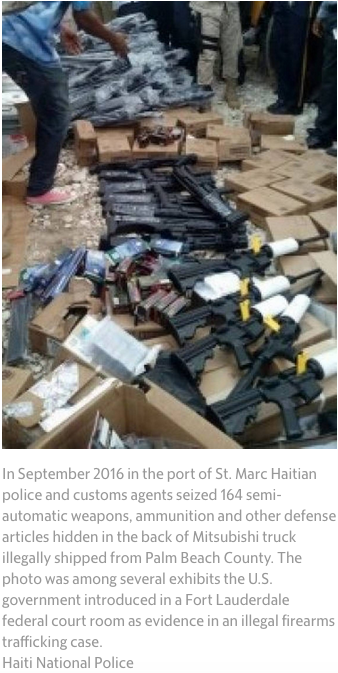 In September 2016 in the port of St. Marc Haitian police and customs agents seized 164 semi-automatic weapons, ammunition and other defense articles hidden in the back of Mitsubishi truck illegally shipped from Palm Beach County. The photo was among several exhibits the U.S. government introduced in a Fort Lauderdale federal court room as evidence in an illegal firearms trafficking case. In the conclusion of their report, police investigators asked that a Haitian judge issue arrest warrants for Thelusma, who later turned herself in, Jimy Joseph and Charles Durand, a cousin of Joseph’s who had accompanied him from Orlando to Palm Beach County to ship the truck, and in the process, listed himself as the shipper. 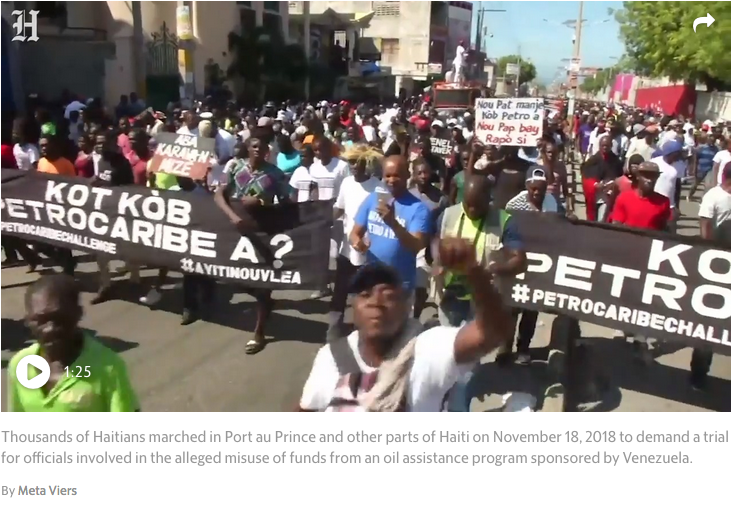 Among those charged: Several former government officials in president Michel Martelly’s administration including Godson Orélus, the police chief, and Vladimir Paraison, Orélus’ one-time police director for the West region. A confidante of Haitian President Jovenel Moïse., Paraison reportedly fled the country after Judge Lumeran issued an arrest warrant and he was dismissed as the coordinator of the president’s palace security. So far only the Joseph brothers are charged in the U.S. case. But during court testimony, the names of Orélus as well as that of the head of the police academy, Francène Moreau, and a Haitian senator, Herve Fourcand, have all come up. For instance, among the documents that Junior Joseph presented to U.S. officials when he applied for export licenses at the State Department and the Department of Commerce was a Haitian National Police weapons import certificate signed by Orélus. Junior Joseph’s defense attorney, Robert Berube, has attempted to separate his client from Jimy, noting that Junior Joseph is a former U.S. marine who runs a tight ship as a federally licensed firearms dealer and the head of Global Dynasty Corps., LLC. He noted that he was cooperative when ATF agents arrived with a search warrant and asked for the logs detailing all of the guns that his store had acquired and sold. The government has tried to show that Junior Joseph not only talked about expanding his firearms and accessories business into Haiti but he also took steps to do so with his brother Jimy..
Anderson Sullivan, a government witness and Homeland Security Investigator, testified that not only did the brothers travel to Haiti together as late as April 14, 2016, according to airline records, but when Jimy Joseph traveled on a one-way ticket from Miami to Port-au-Prince on Aug. 29 “history data indicates that the purchase was made by Junior Joseph.” The trip occurred a day before the shipment’s arrival into Saint Marc.. In addition to the airline records, the government also highlighted WhatsApp conversations that Junior had about the shipment with Fourcand, the senator, and his brother, and someone identified on his phone as Edouard, a friend of the police chief. According to the indictment, several weeks before the truck’s Haiti arrival, Junior Joseph sent a Haitian politician copies of the Monarch shipping documents for the Mitsubishi shipment via WhatsApp. He also sent copies to someone associated with the politician. While Fourcand hasn’t been indicted, O’Connor and Sullivan both met with him at Miami International Airport during on one of his visits to the U.S., and questioned him in connection with their investigation. “He was friends with the police chief… and was talking about opening a storefront in Haiti,” Beary testified. One license was to be able to provide the training and defense materials, regulated by the State Department. The other was to export $8.5 million worth of hardware including 25,000 shotgun shells, 500 vests, 50 shotguns, pepper spray and Tasers. 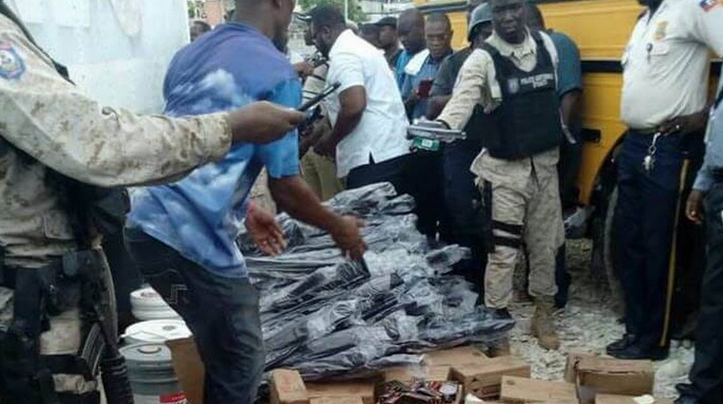 Though the importation of shotguns into Haiti are controlled by the U.S. and the Haiti National Police does not use Tasers, a license was issued anyway by the Department of Commerce on April 1, 2016, for various items to be exported to Global Dynasty Corp., S.A. in Haiti.